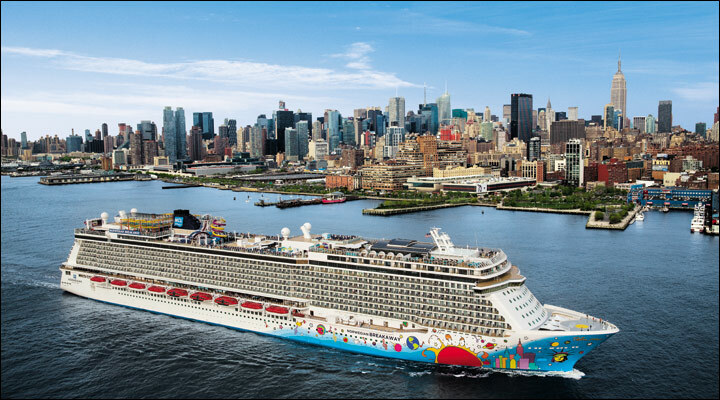 Norwegian Breakaway brings everything you love about NYC to sea. Experience Freestyle Cruising like never before. Connect with the sea on The Waterfront, a quarter-mile oceanfront promenade. Discover a new restaurant or bar each day and night! Step out into the breeze at Ocean Blue, a casual take-away with seaside eats. Dine oceanside at La Cucina and enjoy delicious lobster fettuccine. Or simply enjoy a refreshing mojito with friends. No need to hail a cab and fight traffic to see Broadway smash hits. Simply head down to the Breakaway Theater to bask in the bright lights of Broadway and tickle your funny bone with hilarious comedic performances. Take the plunge on five multistory waterslides including Free Fall – the fastest drop slide at sea. With three levels of action-packed activities at the Sports Complex, including a rock wall, the largest ropes course at sea, a 9-hole miniature golf course and The Plank, extending 8 feet over the side of the ship, there’s something for everyone. With so many bars and lounges to discover, finding your favorite may take a few days. Feel the energy of the pumping music and pulsing walls as you dance till the wee hours at Bliss Ultra Lounge. Grab a burger and beer anytime you like at O’Sheehan’s Neighborhood Bar & Grill. 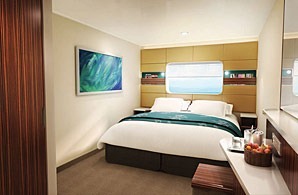 Or chill out, literally, in the only ice bar at sea. Whether you’re looking to meet up with friends or make new ones, there’s always an opportunity to mix it up. 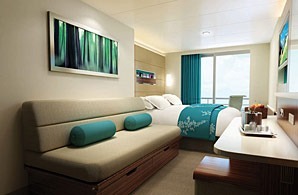 These staterooms include two lower beds that convert to a queen-size bed. (Sleeps up to four. Door opens to center interior corridor for categories ID & IX.) Approx. Size: 129-194 sq. ft. Enjoy a large picture window and two lower beds that convert to a queen-size bed. Category OX also features two pull-down beds. (Sleeps up to four.) Approx. Size: 161-226 sq. 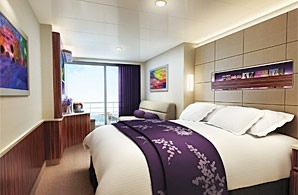 ft.
Take in the amazing views from these staterooms that include two lower beds that convert to a queen-size bed and additional bedding that can accommodate two guests. (Sleeps up to four) Approx. Size: 204-366 sq. ft. 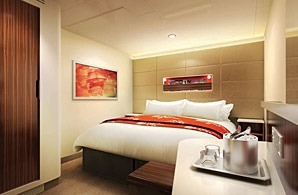 Enjoy a private balcony with amazing views from these Mini-Suites which feature two lower beds that convert to a queen-size bed, an upper bed, and a sofa bed. (Sleeps up to four) Approx. Size: 236 sq. ft.